The Syndicate is celebrating their 5th anniversary as Beijing’s premier Drum & Bass music organizers and you are invited to join the celebrations, Friday Feb 27, @ Yugong Yishan. Formed in 2004, The Syndicate are the longest running Drum & Bass promoters on the Mainland, pushing drum & bass and dubstep sounds in Beijing, regularly bringing in the top DJs in Drum & Bass and Dubstep. To thank you, the Beijing party people for your support, they’re throwing their biggest birthday bash yet! The lineup features all your favorite Syndicate DJs and MCs as well as special guests from near and far. 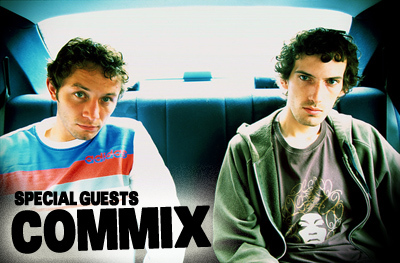 Coming straight out of Cambridge, UK, Commix are one of the most highly regarded drum & bass production duos around, signed to two of the biggest and best labels in Drum & Bass - both Goldie’s Metalheadz label and Hospital Records, which reveals their diverse and multi-faceted sound. While scoring releases on respected labels Good Looking, Shogun Audio, 31 Records and Creative Source, the duo were also the first artists to release a full length album on Metalheadz with their 2007 album “Call to Mind”, which was called one of the most adventurous and accessible drum & bass recordings of the year. Commix tunes have long been crowd favorites here in Beijing and The Syndicate is honoured to have them as special guests for the Syndicate 5th Birthday party.